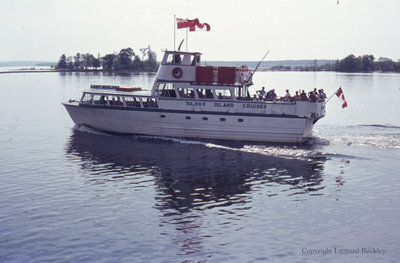 A colour slide of a boat taking a tour of the 30,000 Islands region of Georgian Bay. The 30,000 Islands region of Georgian Bay is considered the largest chain of freshwater islands in the World. Cruise on Georgian Bay, June 1977, Leonard Beckley. Whitby Archives A2014_002_004.